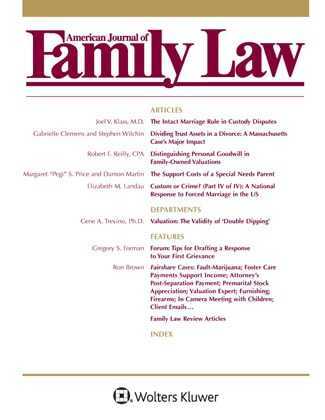 The American Journal of Family Law provides in-depth relevant, commentary on the current issues in today's practice. This quarterly journal is a family law resource that blends the practicality of experience with the credibility of thorough research. Each issue is authored by recognized leaders in the field to interpret changing perspectives and help prepare for new developments in family law practice and litigation. The American Journal of Family Law includes sample forms, checklists, and useful guidelines for day-to-day use.